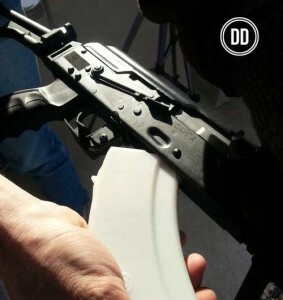 Printed AK47 magazine designed and printed on a 3D printer by Defense Distributed. 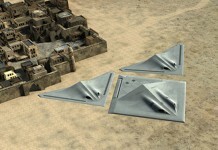 Photo: Defense Distributed. 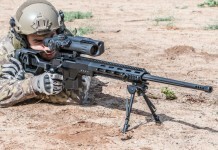 Few months ago Texas based Defense Distributed had an idea – to produce weapon accessories using new 3D printing technology. It started with ‘printed magazines’ for AK47 made of from ABS, a thermoplastic material processed into net-shape form by 3D printers. Each magazine sells for $47. A more complex system – the lower receiver for AR15 sells for $150. But the accessories business wasn’t exciting enough. Taking technology beyond the limits was more fun. 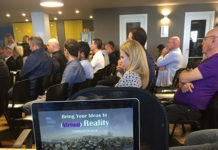 It also created a lot of buzz – over five months, 750,000 people viewed on youtube how the lower receiver fails in a firing test. So Defense Distributed decided to take the next step – produce a complete printable weapon and distribute the code free on the web, facilitating a Wikipedia like printable firearm – hence ‘WikiWep’. Defense Update reports. 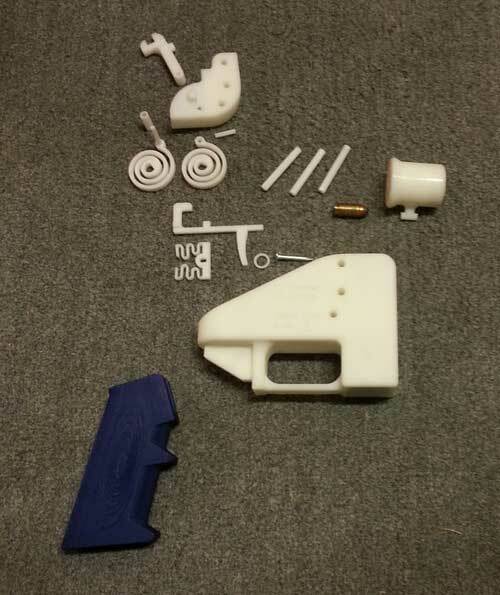 Few months later, the project has got a whole new dimension, with news networks, weapon activists, even legislators airing their opinions about the risks and opportunity of 3D printed weapons, that can be produced by anyone having a commercially available 3D printer and internet access. Defense Distributed founder Cody Wilson says he wants to “produce and publish a file for a completely printable gun – or as near to completely printable as actually possible with current technologies.” Many are sharing their excitement – one day after releasing their dramatic test video “The Liberator” was aired it logged over 800,000 views on Youtube. During the hour it took us to write this post the number passed one million. The weapon demonstrated in this video is simple. The largest pieces are the pistol grip and receiver device, seen surrounded by a number of smaller internal components, including the hammer’s springs. The test firing included a single .380 caliber bullet. Cody Wilson told Wired Danger Room he plans to release barrels capable of firing nine-millimeter and .22 caliber bullets. “I think a barrel like this can do five to six rounds,” Wilson said. “It’s very important you get a central strike on the primer cap, or you’ll get a misfire. We had a number of misfires in .380.” Though Wilson is critical of his gun — he calls it overbuilt, and too big, but says it’s easy to fire. There’s no safety. At one point during testing in recent weeks, one of the barrels exploded. But the design does work, he said. 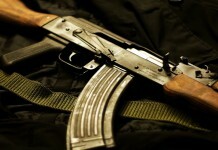 There are questions about the legality of such guns, printed or not. On Sunday Senator Charles Schumer of New York call for the banning of 3-D printed handguns, because they are made of plastics which are not detectable by metal detectors. The only metal part in Wilson’s gun is the firing pin, too small to be detected by metal detectors. The senator also proposed updating the Undetectable Firearms Act of 1988 — which bans guns that can defeat airport security metal detectors — to include printable gun magazines. Defense Distributed has a federal firearms manufacturers license, which Wilson sought after being questioned by the Bureau of Alcohol, Tobacco and Firearms in 2012. That was shortly after a 3-D printer Wilson had rented was seized by its manufacturer over worries he’d violate the Undetectable Firearms Act. The law, which is set to expire this year, exempts licensed manufacturers to produce plastic guns for use as a models and prototypes. In few months the 3D printed weapon has become a battleground between weapons supporters and opponents in the US. 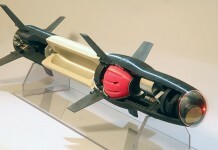 Provided candidate files and prototypes can make it through testing, the next phase of this goal requires adaptation of the design down to some of the most commonly available of 3D printers. Defense Distributed has chosen the RepRap printer to be this platform, but the manufacturer is not keen about their product becoming a platform for anarchist weapon buffs. “We hope the result will be an easily accessible and replicable design shared with the world. From such a point, any person has near-instant access to a firearm through the internet.” Wilson wrote. He doesn’t claim his new weapon is ready for use. In fact, each video shows various failures in firing. But Wilson is concerned that the safety issue will be used against his WikiWep initiative. “We want to minimize negative media about the safety concerns of untested firearms and the inevitable suggestion that government agencies are necessary protect us from ourselves.